These KeeKit luggage locks are recognized by Transportation Security Administration, their agent will check your luggage without damage your lock. With a red indicator, if pops up, then it means that your luggage was checked by TSA agent, and you can check your luggage again to ensure that everything is OK.
3-digit design, offers you 1000 combinations, which are really hard to crack, you can reset your own combinaitons whenever you want. Easy to use, these luggage locks providing you keyless convenience, no more worries about losing keys, ensure a relaxing easy trip. The 100% zinc alloy body, with lightweight and weather-proof design, these locks are perfect for outdoor use. Dimension: 1.2 x 0.4 x 2.4 inches, shackle diameter: 0.13in. 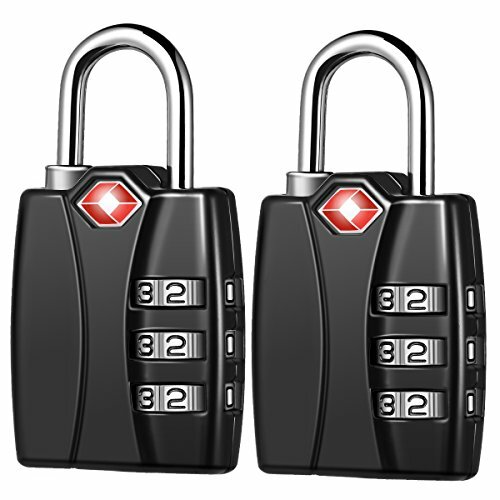 These KeeKit combination locks are great for travelling, to lock your bags, luggage containers, suitcases, they also fit for gym lockers, school lockers, gates, toolboxes, etc. TSA Approved Luggage Locks: Recognized by Travel Sentry, these luggage locks can be opened and relocked by TSA agents, they will not be damaged after checking by airport security. Open Alert Indicator: These KeeKit luggage locks have an Open Alert Indicator to help you confirm whether the lock was opened, if the red button popped up, then your luggage was opened to check. Sturdy & Durable Design: Made of high quality zinc alloy, the luggage lock is anti-rust and weather-proof, sturdy and durable for outdoor and indoor use. Widely Used Padlocks: These TSA approved luggage locks are perfect for international travel, they works well to lock your luggage, suitcase, backpack, baggage, gym lockers, employee lockers, cabinets, toolbox, etc. If you have any questions about this product by KeeKit, contact us by completing and submitting the form below. If you are looking for a specif part number, please include it with your message.